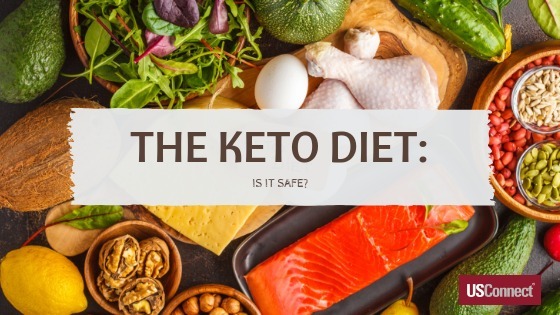 The Keto Diet – Is It Safe? You’ve probably heard of the Keto Diet or known someone who’s following it. It has gained popularity in recent years because it can result in quick and sometimes extreme weight loss. But is it safe? The Ketogenic (Keto) Diet requires a person to eat little-to-no-carbohydrates and instead consume mostly high-fat and protein-rich foods. The purpose of the diet is to change your body’s metabolism so it reaches a state called “ketosis.” This means that instead of your body getting energy from carbohydrates, once in ketosis, your body shifts to burning fats for energy. This can then result in significant weight loss. However, nutritionists and doctors have cautioned about following this type of diet. Not only is it hard to follow long-term, but it also omits many fruits and vegetables that are necessary for important nutrients. It may also pose cardiac risks, especially for those who already suffer from heart disease or high blood pressure or have other risk factors. While eating a diet full of meat, cheese, and butter may sound appealing to some, the Keto Diet actually requires complex eating plans to get the right amount of proteins, fats, and carbs to put the body into ketosis. Followers of the diet also develop what’s known as the “keto flu,” which can cause symptoms such as fatigue, insomnia, nausea, constipation, or diarrhea, fogginess, and increased hunger. Symptoms usually start three days to one week after starting the diet and can last up to two weeks or more. Because the diet restricts carbohydrates to only 2-4 percent of the diet, nutritionists say it’s not sustainable long-term. You will need to take supplements and vitamins since you won’t be getting essential nutrients from foods, and you may also need fiber supplements to keep your digestive system working properly. Not only are you depriving your body of crucial nutrients found in fruits and vegetables, but (like most people) you may start to crave bread or pasta—then give in to those cravings. As soon as carbohydrates are reintroduced, any weight lost will be quickly regained. The ketogenic diet is a very restrictive plan that really only provides a temporary, quick fix. Because it’s too difficult to stick to, you would be better off making a lifestyle change by eating a well-balanced diet that incorporates good carbs, such as whole grains, combined with healthy fats and moderate amounts of proteins, with a focus on whole foods and less heavily processed foods. Add in portion control and exercise, and you’ll be on your way to a healthy, long-term weight loss. Schedules tend to get hectic this time of year with the kids back in school and busy with extracurricular activities. With everyone running in different directions, it’s easy to forgo family dinners and just run by the drive-thru. While that’s OK when you’re really in a pinch for time, you don’t want to make it a regular habit. Here are five healthy dinner recipes for stress-free meal planning for families on-the-go. 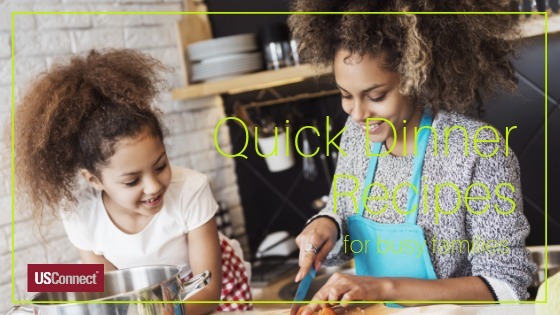 Each recipe takes only 30 minutes or less to make, so you’ll still have plenty of time to help kids with homework, cart them to and from sports, piano or dance lessons, and maybe even do a load of laundry. An easy meal for busy weeknights that kids and grown-ups will both love. Unroll-and-bake crescent rolls are stuffed with shredded barbecue chicken, Swiss cheese, and a tasty cream cheese blend. Dress up frozen green beans for a healthy side dish and you’re done. These also make great game-day snacks! A dish made with store-bought, ready-to-eat rotisserie chicken combined with cheese and other ingredients to make a hearty Mexican dish. You can substitute tomatoes for olives or add black beans for some fiber, or modify the recipe based on your family’s preferences. It can be easily created in minutes! Made with ingredients you probably already have in your kitchen, this tuna recipe can be made in about 20 minutes. 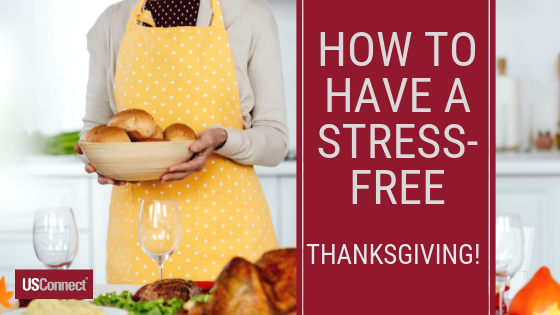 This is a great option when you’re really pressed for time because you can easily substitute ingredients based on what you already have on hand. The only things you’ll really need are some sort of pasta, tuna, bacon, eggs, cream, and Parmesan or Romano cheese. For those upcoming cold or rainy nights, this three-bean chili packs just enough spice to warm you up. Plus, it’s easy to make and serves six, so if you have a smaller family, it’s great for leftovers for lunch. Kids love mac and cheese, and this version adds beef for added flavor and protein. Serve with a side vegetable for a complete meal of comfort food for any busy weeknight. For the past several decades, Baby Boomers and Generation-Xers have dominated the workforce. 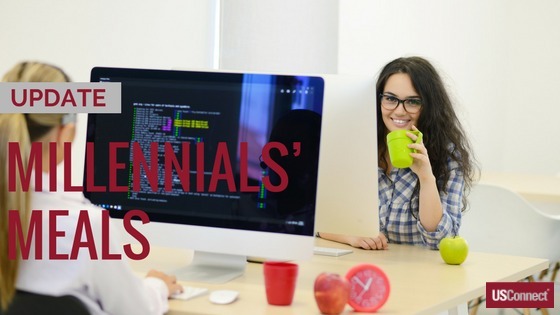 But in 2015, according to a study by the Pew Research Center, Millennials surpassed both Gen-Xers and Baby Boomers in the workforce for the first time. This is a trend that will only increase as more Millennials enter the workforce and more Gen-Xers and Boomers leave it. Office and workplace design that allows for flexibility encourages collaboration. Break rooms, in particular, should reflect the fact that work is rarely a 9-to-5 endeavor and that employees may use these spaces for important “water-cooler” discussion that improves productivity. Food perks. Some think that free food is less important than a collaborative environment or opportunity for improvement. Others, however, point to a study that found that 67 percent of Millennials would feel more valued at work if food perks were increased. Social responsibility. Millennials value working at an organization that makes a positive difference in the world, and that value extends to the food brands they buy. A study by the National Marketing Institute found that Millennials are more likely to buy brands that are transparent about their sustainability and charitable giving, with 65 percent recognizing the Fair Trade Certified label. How many hours per day do you spend sitting at your desk? As previously discussed in our post about standing desks, working Americans spend an average of six to 10 hours a day in a seated position, usually in front of a computer. 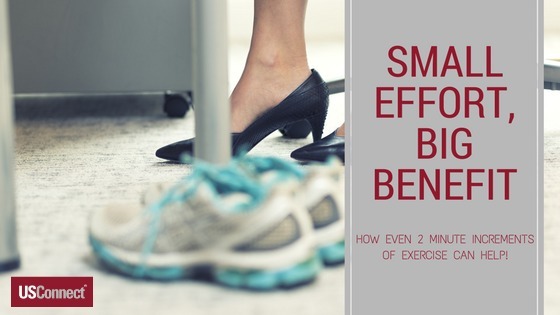 In fact, whether they work or not, most Americans are quite sedentary; they spend most of their time sitting, and they walk fewer than 5,000 steps per day. The sitting aspect seems to be particularly troublesome for people’s health. Research has shown that long periods of sitting, even for those who also exercise frequently, can have serious negative health impacts, including type 2 diabetes, cancer, dementia, heart disease, and a higher risk of dying. Given the conflicting priorities of work, family, and other commitments, most Americans (80 percent) have trouble meeting the American Heart Association’s (AHA) recommendations for exercise and activity: at least 30 minutes of moderate-intensity aerobic activity at least five days per week for a total of 150 minutes per week. As the AHA notes; however, something is always better than nothing. If you can’t do a full 30 minutes, make it 15. If you can’t do it five days a week, do it three. A recent study even suggests small intervals—two minutes per hour—of light activity can improve overall health. The study followed 3,243 participants for three years and found that just two minutes per hour of light-intensity activity, like walking, made a significant difference in the participants’ long-term health, including a 33% lower risk of death. Reducing sitting time can also have some immediate positive effects, like shaking off lethargy and avoiding back pain. When a person sits for an extended time, most of his/her weight rests on his/her sacrum. Over time, this compresses the vertebrae and leads to pain and discomfort. Similarly, most desk chairs keep users’ hips flexed at an angle of 90 degrees or less. After hours of sitting like this, the hip flexors can shorten temporarily; this can lead to low back pain. Getting up for a two-minute walk can let those bones and muscles relax and recuperate, and the increased blood flow can improve mood and alertness. It’s a win-win! How do EEOC Regulations on Wellness Programs Affect Employers? On January first, The U.S. 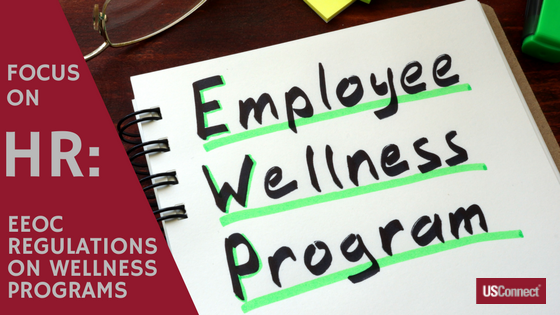 Equal Employment Opportunity Commission (EEOC) rules on employer-offered wellness programs went into effect. These rules, issued in May 2016, provide guidelines on how these wellness programs must remain fair with respect to all employees and their rights to privacy. The rules come as a response to the recent increase in employee wellness programs: initiatives that offer health insurance discounts to employees who participate in fitness and weight loss programs. Many of these initiatives collect personal medical information, including through the use of biometric screening— potentially creating a risk of privacy violations. Under the new rules, “Information from wellness programs may be disclosed to employers only in aggregate terms.” Further, “The value of the maximum incentive attributable to a spouse’s participation may not exceed 30 percent of the total cost of self-only coverage.” Since financial incentives have been linked to increased employee wellness, these rules may immediately affect the many companies that offer these wellness programs. January is Hot Tea Month, and what better time of year to sit back with a nice hot “cuppa” your favorite infusion? 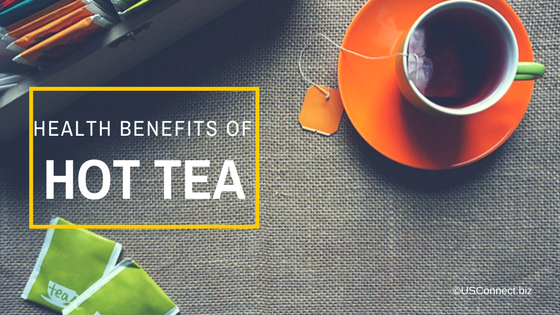 With many health benefits, tea is one of the world’s most universally enjoyed drinks. And with the increasing globalization of food and beverage trends, you can explore some of the world’s tea traditions at your own desk. Britain: American colonists protested the British tax on tea by dumping a shipload of it into Boston Harbor. Now, over 200 years later, Americans still prefer coffee to tea, while Great Britain remains a predominantly tea-drinking nation. Most Brits prefer a standard black tea like PG Tips, but for a more refined taste, try Earl Grey, English Breakfast, or Prince of Wales. South Africa: Rooibos (or Redbush) tea is actually an herbal tea brewed from the leaves of the rooibos plant. It has a distinctive red color and a sweet and fruity flavor that derives from the post-harvest fermentation process. Like many teas, Rooibos is high in antioxidants, and its supporters cite properties that fight cancer, promote heart health, and prevent diabetes. Argentina: If you happen to have a dried calabash gourd hanging around, you can re-create the South American tradition of drinking Yerba Mate, brewed from the South American rainforest holly tree. This naturally caffeinated beverage is served in a gourd (or a gourd-shaped cup) and passed around among friends to drink with a straining straw called a bombilla. Tibet: Want to try something really exotic? Try Tibetan po cha, or butter tea. Traditionally, Tibetans brewed black tea for hours before blending it with yak butter, milk, and salt. The hot tea is warming in the cold Himalayan mountain air, and the salt likely helps counter the dehydrating effects of high-altitude living. Is your company LOHAS-focused? If it consistently offers healthy, sustainably-sourced food options, then it’s following a trend of many individuals and companies around the world. LOHAS – an acronym for Lifestyle of Health and Sustainability – describes a demographic swath of the population whose purchasing decisions are based on issues like environmental impact, social responsibility, and personal fitness. LOHAS consumers are generally financially comfortable, but they are not necessarily the wealthiest consumer sector; rather, issues of health and sustainability often override cost and convenience in their shopping and eating habits. For instance, many LOHAS consumers choose to pay the extra money or travel the extra distance required in order to eat organic vegetables—feeling that the health and societal benefits of buying organic are more important than saving money. Not surprisingly, LOHAS spending decreases during times of economic stress, like the recession of 2008. However, the as the economy recovers, LOHAS spending has increased. An industry group estimates that 13-19% of the American population can be considered LOHAS consumers; that is one in four adults, or almost 41 million people. In a company of any size, some percentage is almost certain to be comprised of LOHAS consumers. People’s LOHAS-oriented food purchases can vary, depending on their focus. For many, organic food is of primary importance: a fact that is reflected in the growth of the organic food movement. For others, avoiding genetically modified organisms (GMOs) is paramount. Still others focus on food sustainability, avoiding foods (like certain fish) that face over-harvesting. For some people, the social impact of the food is most important; they choose fair-trade coffee, for instance, or avoid foods (like some beef and coffee) that require clear-cutting forests. For many of these LOHAS choices, third party organizations provide labels to identify their products as adhering to these principles. Some LOHAS customers’ focus is not on the food itself, but on the packaging. With a greater emphasis on environmental responsibility, these consumers will actively avoid food with excessive wrapping of plastic, paper, and other disposables. These eco-conscious consumers are more likely to bring a meal from home in order to avoid physical waste, even though buying food at work is more convenient. Take advantage of these great deals by using your USConnect OneCard on any of these products now through January 1, 2015. Buy 4 Gatorade 20 oz. bottles (any flavor) and get the 5th one free. Buy 4 Lipton Tea 20 oz. bottles (any flavor) and get the 5th one free. Buy 4 Mt. Dew Kickstart cans and get the 5th one free. Buy 4 Starbucks Iced Coffee cans and get the 5th one free. Buy 4 regular 7UP, A&W, or Sunkist 20 oz. bottles (mix and match) and get the 5th one free. Buy 4 Dr Pepper 20 oz. bottles (any variety) and get the 5th one free. Buy an Aquafina 20 oz. bottle and a Sun Chips LSS together and save $0.50. Buy 2 Red Bull cans and save $1. Buy 4 M&M Peanut singles and get the 5th one free. Buy 4 Twix singles and get the 5th one free. Buy 4 Mars Bites (3 Musketeers, Snickers, or Milkyway) and get the 5th one free. Buy any 4 Dove Chocolate Bar singles and get the 5th one free. Buy 4 Welch’s Fruit Snacks single serve (any variety) and get the 5th one free. Buy 4 Nutri Grain bars and get the 5th one free. Buy 4 Swedish Fish or Sour Patch Kids (2 oz. size, mix and match) and get the 5th one free. Buy 4 Chex Mix Muddy Buddies 1.75 oz. and get the 5th one free. Buy 4 Mrs. Freshley’s Jumbo Honey Buns and get the 5th one free. Buy 4 Mrs. Freshley’s Chocolate Cupcakes and get the 5th one free. Buy 4 Nestle Candy Miniatures bags (mix and match) and get the 5th one free. Buy 4 Doritos Nacho LSS and get the 5th one free. Buy 4 Rold Gold Pretzels LSS and get the 5th one free. Buy 4 Baked Cheetos LSS and get the 5th one free. Buy 4 Cheez-it’s Single Serve or LSS and get the 5th one free. Buy 4 Pierre Sandwiches (any flavors) and get the 5th one free. With your USConnect OneCard, you earn points on each purchase. Cardholders earn 5 reward points for every dollar spent. Redeem those points online for cash back on your account. Vending machines and snack carts have their fair share of tempting snack foods, but you can make healthier choices even when you are in a hurry at work and must rely on these options for lunch or a snack to get you through that next meeting. Contains less than 35 fat calories for every 100 calories of the food. Contains 1 gram or less of saturated fat calories for every 100 calories of the food. Contains 0 g of trans-fat. Nuts are exempt from fat criteria as they are high in monounsaturated fat and are therefore a healthy choice. Contains less than 15g of sugar per serving, excluding sugar from fruit. Sugar-free choices are acceptable if they meet the fat criteria. Snack items: Contain less than 480 mg of sodium per serving. Entrée items: Contain less than 1000 mg of sodium per serving. Item is a lean protein choice (fish, chicken, turkey, tofu, legumes, beans). Must also meet the fat and sodium criteria. No candy-coated or yogurt-coated nuts/seeds. Nuts are exempt from fat criteria as they are high in monounsaturated fat, as stated above. Fresh, canned, or dried fruits without added sweeteners. Fresh vegetables and salads. Dressings must meet fat and sugar criteria. 100% fruit or vegetable juices without added sweeteners, and meet salt/sodium criteria. Whole grain breads and cereals must meet sugar criteria. Prepared legume products must meet fat, sugar, and sodium criteria. Items with at least 2 g of dietary fiber per serving are preferred. Non-fat or 1% dairy products (including cheese). Frozen dairy items must be made with non-fat or 1% milk or meet fat criteria.